Built in 2016, 25 Snowy Egret is a 6+ bedroom Hilton Head Oceanfront gem featuring a private pool and spa, private beach path and bedding for up to 19 guests. The unrivaled views overlooking the Atlantic Ocean are so close and expansive, the pool so large and the quality construction so impressive, you will know you have found the vacation home of a lifetime! 25 Snowy Egret is a gorgeous, custom-built home in Sea Pines Plantation. With a direct oceanfront location and expansive views of the Atlantic Ocean, this luxury rental features 6 bedrooms plus a private study with queen sleeper sofa, 7 full and 1 half baths and bedding for 17-19 guests. High end appointments and quality construction are balanced with plush furniture, cheerful colors and an open floorplan. This home offers exceptional amenities, such as private pool (can be heated for additional charge), spa, outdoor living area with fireplace and grill and extensive patios and a balcony with sunrise-to-sunset views over the ocean. 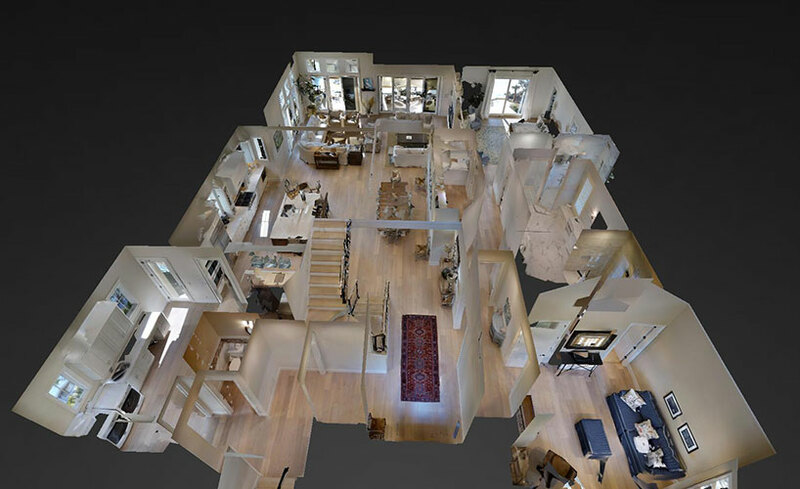 The 1st floor of this home features a large great room, formal dining, living room and open kitchen with center island and breakfast bar. The kitchen is outfitted with high-end appliances, including a gas range and oven. A large laundry room, pantry with spare refrigerator, half bath and access to the garage provide ample utility space. The fully furnished outdoor living area features a grill, fireplace, mounted TV and ocean views and ocean sounds as the perfect backdrop. The master suite features a king bed, flat screen TV, patio access and ocean views. The large master bath has a double vanity with granite counter and walk-in shower with glass doors. Located just outside the master bedroom is a private study with queen sleeper sofa, closet, flat screen TV and full bath. The 2nd floor features 5 bedrooms, all of which have ocean views. The oceanfront bedrooms include a master suite with king bed and single bed, TV and private oceanfront balcony. The right oceanside bedroom features a queen bed, TV and full bath, and the left oceanside bedroom features a king bed, TV, private oceanfront deck and full bath. The 4th bedroom on this floor features a King bed, window with ocean view, TV and full bath, and the 5th bedroom can accommodate up to 6 guests with 4 twin beds, 2 of which include roll-out trundles. This bedroom also features a flat screen TV, small balcony with ocean view and full bath with shower/tub combination. 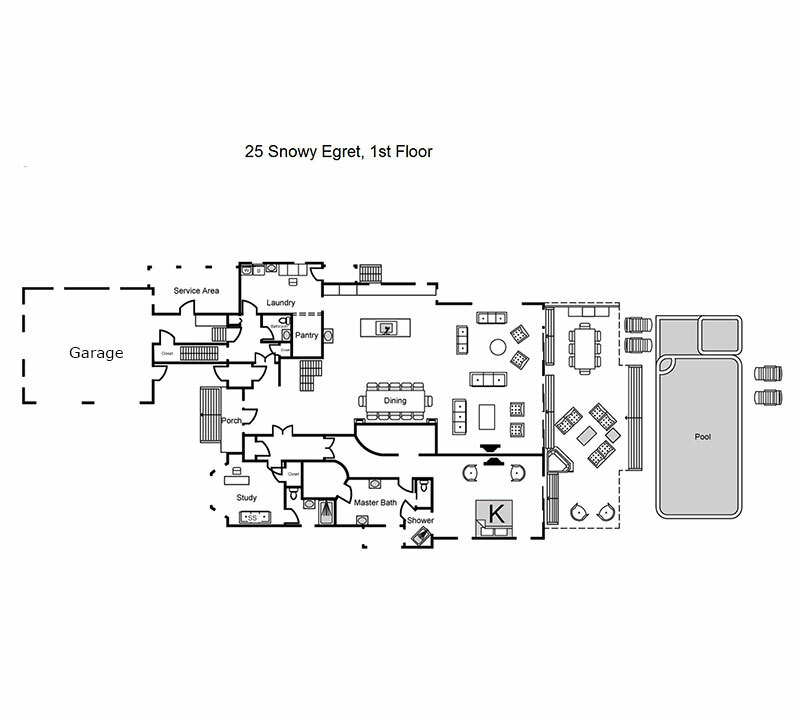 Amenities at 25 Snowy Egret will make you feel like you are staying at your own private resort. The large private pool features a heated spa and separate sitting pool with waterfall feature. The pool deck is furnished with tables, chairs and chaise lounges overlooking the pool with ocean as a close backdrop. Spa heat is included with your rental and the pool can be heated for an additional fee. The outdoor living area is a fully furnished covered patio with ceiling fan, grill, mounted TV and fireplace. The home is outfitted with cable and the latest flat screen TVs, and wireless internet is available at no cost to guests. Great customer service! We had two issues and immediately they were addressed, even on a Sunday someone came to the property. Everything was better than we had hoped for. The house was absolutely perfect for our family. We will definitely return. The double living areas provided ample seating for the whole group. Comments were made about the soft comfort of the sofas and chairs. A favorite were the swivel rocking chairs. Kudos to the decorator. The dining area was roomy enough for all of us to eat together. The pool size and layout made it possible for the oldest and the youngest to enjoy the water all at the same time. We were glad that the size of the bedrooms was smaller and that each bedroom had a private bath while the main living area space was huge with an open floor plan large enough to accommodate everyone for food prep, dining, gaming, and just relaxing. Because we love to cook for the group the extra refrigerator in the pantry was a nice bonus and the three wine coolers were used, too. The ocean views were beautiful. It was a plus that so many of the bedrooms had ocean views. Another plus was the driveway configuration because it allowed for easily parking seven vehicles and made it possible to allow room for people to leave without having to move all the cars. Before we left the ideas for a return vacation were already in the works. Thank you for your outstanding service and focus on making vacation stays a very positive experience. Great company! Thank you for a wonderful stay. We enjoyed the property, and the location! Hope to be back next Spring.